1. Landing in Athens airport or Thessaloniki’s airport, you can get a connecting domestic flight to Paros. Athens International Airport “Eleftherios Venizelos” is connected with plenty of destinations : London,Rome, Berlin,Milano,Amsterdam, Barcelona, Belgrade, Bologna, Bratislava, Brussels, Bucharest, Budapest, Copenhagen, Dublin, Frankfurt,Munich, Geneva, Helsinki, Kiev, Madrid, Malta, Manchester, Marseille, Moscow, Oslo, Paphos, Paris, Prague, Sofia, Tel Aviv, Stockholm, Vienna, Zurich ,New York, Sydney, Abu Dhabi,Amman, Bahrain, Cairo, Doha and more. trip time from Mykonos ranging from half to an hour and from Santorini from 2 to 3 and a half hours.Between May and September there are international charter flights to Mykonos and Santorini (Thira) and frequently connections by ferry and high speed boats. Travel by ferry from Italy (Venice, Ancona, Bari, Brindisi) to Patras. Please see the latest timetables of all ferries between Greece and Italy, for further information. The coaches depart shortly after the ferry arrives in Patras to Piraeus. Daily ferries from Piraeus port to Paros travel all year round. The trip is around 4 hours long & from May to September, with the high speed boats less than 3 hours long ( are available also from Rafina's port). Please, note that you need to land in Athens up to 15.00 hrs to catch the usually last ferry from Piraeus or Rafina port to Paros, around 17:30 hrs. Calculate around 1 1/2 hrs for the bus trip from the airport to the port of Piraeus. (It's the bus "X96" that goes every 20 mins from the airport and costs around 6 Euros per ticket) Calculate around 20 min to Rafina’s port and costs around 3 euros per ticket. Tips: if you need to spend a night in a hotel next of the port of Piraeus, just ask us. If you are into island hopping, you can get directly to Paros from almost all the other Cycladic islands,like Andiparos (less than 10’ distance), Naxos ,Mykonos,Syros (less than an hour). You can get also even from places like Thessalonice, Crete, Ikaria, Samos or Rhodes and if there is not a direct boat, you get a connection from another island. How to reach the port of Piraeus from Athens airport? By bus - Calculate around 1 1/2 hrs for the bus trip from the airport to the port of Piraeus. Information available at www.oasa.gr. Catch the Direct express bus "E96" that has routes every 20’ from the airport to the port and costs around 6 Euros per ticket - no need for the taxi! By metro subway train - information available at WWW.AMETRO.GR and at WWW.PROASTIAKOS.GR. A new direct transport with suburban railway line " Proastiakos" from the port of Piraeus to Athens airport “Eleftherios Venizelos” is a fact. Duration: 63mn , there will be hourly runs. Cost: about 10€. By taxi - taxis from the airport can take an hour to go to Piraeus, depending on traffic and would cost about 50€ on normal day tariff. Please, watch the taxi meter and overcharges. We can arrange a taxi waiting for you at the port or airport. Should I book our ferry tickets in advance? It is needed, especially during high season, (e.g Easter and all July & August weekends). How to reach Ambelas and Margarita’s resort? By your car or by renting a car, (prices vary from 25 Euro & up per day, depending on model and season) or a motorbike (starting price: 10 Euro). The advantages are that with a car you’ll travel easier and you don’t have to carry around your heavy luggages. You will be able to explore the whole island of Paros, have a more comfortable tour and carry more people (so you can share the cost). The roads in Paros are all in good condition. By taxi: hop on a taxi, next to the port, or to the airport, otherwise we can arrange for you (especially in high season), a pick up service from port or airport. From and to the Airport of Paros at the rate of € 38.00 for two, three or four people. Taxi driver will be waiting for you at “arrivals” with a sign stating your name. otherwise give us a call to 0030 2284052362 and we will pick you up from there. * From Paros port go north (uphill) in the direction of Naoussa. After 500m there is a V junction. Take its left side.The right one drives you to Lefkes village. Drive straight all the time until you get to the entrance of Naoussa. When you see a big super-market on your right and a petrol station on your left, turn right. Go straight until you get to a T junction. Turn right in the direction of Ambelas, and after 100 meters, turn left towards Ambelas. After 3 kilometers, you 'll see Ambelas little fishing port ,turn left following the seaside road and after a little chapel above the sea, you see our sign Margarita Studios ,you turn left and continue for 200m until you get to our door. Turn right to drive directly to our parking area . We are looking forward to your arrival and hope that you will contact us if we can assist you with your travel plans in any way. From Paros airport, head north or turn right (left when you are with your back at the airport) towards the direction of Parikia. Continue straight on until you arrive in Parikia (you will see shops, houses, etc.). 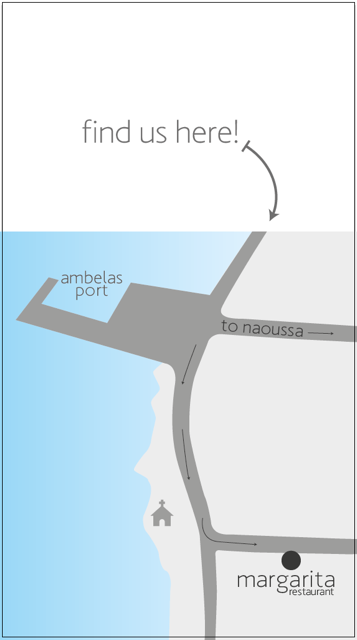 When you get to a T junction (in Parikia), turn right and go straight towards Naoussa. After 500 meters, there is a V junction. Take the left side. Go straight until you see the entrance of Naoussa. When you encounter a big super-market on your right and a petrol station on your left, turn right. Turn right and after 100 meters, turn left towards Ambelas. After 3 kilometers, you will see Ambelas' little fishing port .Turn left following the seaside road and after the little chapel above the sea, you will see our sign “Margarita Studios”. Once you do (see the sign Margarita Studios), turn left and continue for 200m. Turn right to drive directly to our parking area.